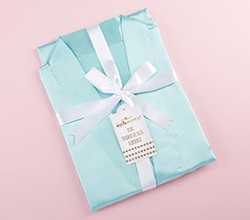 Kate Aspen’s Aqua Elegant Lace Kimono Robe is the perfect pampering gift for you and your bridal party. 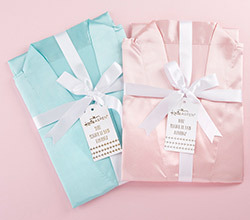 Featuring a waist tie with matching silky ribbon sash and delicate lace trim lining the bottom, these kimono robes are both beautiful and lightweight to help you get ready for your big day. For a personalized touch, each robe can be embroidered to make a special gift for each of your girls. 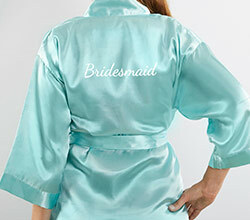 When wearing the robe, you'll know it's time to let the pampering begin! Silky aqua polyester robe with lace trim and tie waist.